If a company allways orders the PCBs from the same manufacturer, the required manufacturing data is also allways the same. The FloWare mudule Post Processing offers a feature set to generate the output in allways the same way in OrCAD PCB Editor and Allegro PCB Editor. 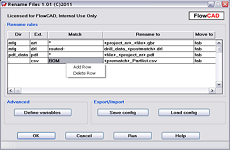 You can generate sets of output data of existing reports in allways the same order. Before you can run scripts or other SKILL (FloWare) routines to define parameter settings. The configuration will be saved in the database and the output job can created with exactly the same settings. You can define in Post Processing different output jobs and start them individually. The created files can follow a naming convention (Wildcards, Variables and Pattern Tags).